A grinder is generally used to precisely shape and finish the given materials with low surface roughness and high surface quality. It is primarily a finishing operation that removes relatively small quantities of metal, to deliver highly accurate products. However, certain grinding applications also involve swiftly eliminating high volumes of metal. It comprises of a bed with a fixed guide to hold the work piece; and a power driven wheel that spins at a predetermined speed. The head of the grinder can be set to move across a fixed work piece; or the work piece can be moved while the head remains in a stationary position. The position of the grind head or table can be fine controlled by using a hand wheel, or a computerized numeric controller. It generate considerable amounts of heat; hence coolants are used to cool the work piece to avoid overheating, prevent accidents and maintain its tolerance. In some high accuracy grinding machines such as the hydraulic cylindrical grinders and surface grinders; the final processes generate relatively little heat; thus coolants are not needed as the temperature is tolerable. A bench grinder is manually operated and normally has two wheels of different grain sizes that are fixed on a floor stand or work bench; to perform roughing and finishing operations. It is mainly used to shape tool bits; and repair or make various tools. A belt grinder includes a machining process to grind metals and other materials, with the help of coated abrasives. Belt grinding is a versatile process that involves several kinds of applications such as stock removal and finishing. A jig grinder is used for finishing jigs, dies, and fixtures. It grinds holes and can be used for complicated surface grinding and finishing work. A gear grinder is used to remove the last few inches of material while manufacturing high precision gears. 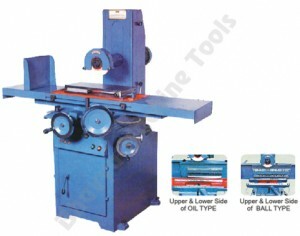 An efficient surface grinder may be manually operated or CNC controlled. It has a head that is lowered, while the work piece moves back and forth; past the wheel on a table. 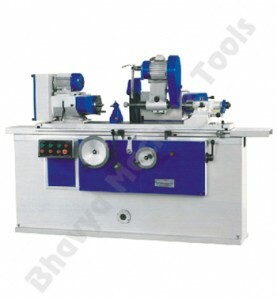 Tool and cutter grinder, and the D-bit grinder perform the functions of a drill bit grinder, or other special tool room operations.